How to Fix 0xc00000142 Error (Can’t Use Google Chrome)? I recently started having with the constant 0xc00000142 error when I opened my Google Chrome on my Windows 10 laptop. I try my security tool to fix the error and system things, but nothing helps, this error still happens when opening Google Chrome. What can I do? Can you help me with this issue? Why 0xc00000142 Error (Can’t Use Google Chrome) Occurs? 0xc00000142 Error is a Windows error. 0xc00000142 Error would happen when you open Google Chrome, Powerpoint, Excel, Microsoft Word and other applications on your computer when an unexpected condition occurs or when a desired operation has failed. 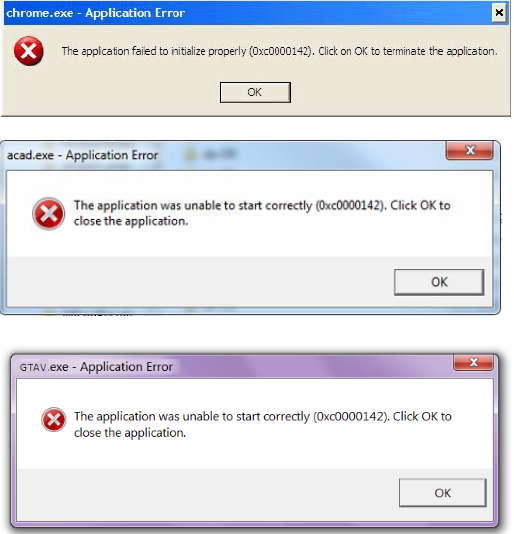 You may get the popup saying “The application failed to initialize properly (0xc0000142). Click on OK to terminate the application.” You might also get another error code saying (0xc0000005). This kind of error code takes time to fix and it is a tough work. When 0xc00000142 Error occurs, you will not be able to use the damage application, that’s why you can’t use Google Chrome. A Windows error is an error that happens when an unexpected condition occurs or when a desired operation has failed. Windows error or system error mat be fatal and trigger your programs or application like Google Chrome to freeze and crash or it may be seemingly unstable, run more slowly and crash more frequently. Anyway, you will not be able to run the programs and application at all. Published by Leo R. Oscar on October 27, 2017 10:11 am and last modified on November 6, 2017 7:17 am. iPhone/iPad Fell Prey to The 28.1 Warning – How to Fix? I was on Google searching the information about renting a house and a pop up came up saying my device had been infected with “Your battery is 28.1% damaged because of harmful viruses from recent adult sites” and to hit ok to fix it. Well I didn’t hit ok I just closed the website out. Should I be worried? I am so scared with the warning. Published by Matt Johnston on June 27, 2017 5:40 am and last modified on June 30, 2017 9:04 am. How to Fix Computer Won’t Connect to the WiFi? My Dell laptop won’t connect to the Wi-Fi but can see the wifi routers account, or more correctly says “limited connection”. Every other pc, laptop and phone in the house can connect to the wifi very well. This Dell laptop won’t connect ever since the auto-upgrade to windows 8.1. I would consider that the problem is with the router except that all my other devices connect to it just fine. Also it should be noted that this Dell did connect and use the wifi router just fine until the upgrade to 8.1. So I didn’t think it is the router problem, but I confounded by why this won’t work. Do you have any suggestions? Please help me. Why computer won’t connect to the WiFi? How to fix? Published by James B. Gonzalez on January 3, 2017 5:53 am and last modified on January 24, 2017 8:13 am. How to Fix File Explorer Keeps Crashing? My file explorer simply keeps crashing when navigating in folders. Everything has worked fine for the first few months on my computer, but in the last week I have had the issue every single time. I open up a folder and it immediately goes to one full screen. If I try to move or resize the folder, the folder resizes very small and blinks constantly. Basically it crashes and I have to right click and close File Explorer. And I go to “This PC” and the window that pops up shows all my drives but not how much storage they have left. When I try opening a drive or folder the window and taskbar closes down and reopen after a few seconds. It happens almost every time I try opening a folder. Do you know how to fix this? Please help. Why File Explorer Keeps Crashing? How to fix? Published by James B. Gonzalez on December 29, 2016 6:14 am and last modified on January 24, 2017 8:19 am. How to Fix High CPU Usage of System and Compressed Memory? Don’t know How to Fix High CPU Usage of System and Compressed Memory? I have a trouble that is the process called System and compressed memory started acting up, when I’m browsing demanding sites CPU usage spikes to 40%-60% causing my sounds to get crackles and freeze for a split second. It’s extremely annoying and was not happening before. It started this week when I came back after a few weeks and my PC updated many programs and the system too I guess. It happens when I’m using Chrome, Vivaldi, Steam, even when Before Experience is downloading new drivers… I don’t know what this thing does and where it came from but I want it gone obviously it’s not working the way it’s supposed to. I haven’t found much useful information on how to get rid of it and what I found either didn’t apply or didn’t work. Can you help me fix this problem? Published by James B. Gonzalez on December 21, 2016 11:40 am and last modified on January 24, 2017 8:21 am. How to Repair NETWORK_FAILED Error in Chrome? How to repair NETWORK_FAILED Error in Chrome? I can’t download anything on my Google Chrome. Whenever I try to download an extension or an app, I get an error saying NETWORK_FAILED. I cleared my cookies and removed any malware, but that didn’t help. Additionally, any extensions I had installed before are now saying “not from Chrome Web Store” and some of the extensions and apps I had before were deleted w/o my permission (adblock plus, hangouts and chrome remote desktop). Can you help me fix this problem? How do I get NETWORK_FAILED Error? How to fix? I am having the same problem after what looks like another Google FU update that has rendered half of my extensions unusable. Network Error problem has been occurring for weeks now. I have been trying to install, uninstall, re-install, etc every few days “An error has occurred….Network Failed”. After 6 weeks, this is getting annoying. Published by James B. Gonzalez on December 20, 2016 5:25 am and last modified on January 24, 2017 8:26 am. How to Fix Firefox Keeps Crashing? Hello, I’m using Firefox browser on Windows 7 Pro 64-bit. The Firefox has been crashing at random times. I have been ignoring it for the most part, but it is has been happening more frequently the last few days, so I want to finally try to figure out what’s going on. I have tried updating Firefox a few times, as well as my add-ons and plug-ins. But it hasn’t helped. And as far as I can tell, there doesn’t seem to be anything specific that triggers the crashes. Sometimes it will happen when I go to a YouTube link and sometimes it will happen when I’m in the middle of reading plain text. And sometimes it happens when I’m not doing anything at all. What do I do? It would be greatly appreciated if you can help me. Why the Firefox keeps crashing? How to fix? Published by James B. Gonzalez on December 5, 2016 11:30 am and last modified on January 24, 2017 8:31 am. Virus in USB Flash Drive – How to Remove Manually? Have you ever experienced that when you plug in your USB flash drive into your computer then there is an alarm telling that your USB flash drive has a virus? Have you ever experienced that after you make a presentation and plug your USB flash drive into your school computer then when you plug it into your computer, you was told that there is a virus in your USB flash drive? Have you ever experienced that when you plug your USB flash drive into your computer, then you can’t open it and was told that you need to clear everything? If you do, do you know how to fix this problem and use your USB flash drive without virus? This article will let your know the way to fix this problem. How to Remove Virus From USB Flash Drive? In the past, many people were fond of using USB flash drive because it is convenient to take it to everywhere and it could store many data. Except the usage of storing data, it also could be used to install Windows operating system to get the computer workable again. It is such a good tool for people. However, the malicious virus could easily infect the USB flash drive. When your USB flash drive is plugged into a computer which has a harmful virus, the USB flash drive could also be infected, too. Or when some data bundled with some kind of virus are stored in your USB flash drive, your USB flash drive also could be infected. If your USB flash drive has been infected by some kind of malicious virus, please take action to remove the virus immediately. If you don’t remove it immediately, your computer may be infected by the virus as well. Don’t know how to remove the virus completely from your USB flash drive? Let’s see below. Hi, I have one computer running windows 7, I can’t open the App store icon on the desktop, and I failed to remove the Office 2013 in Control Panel. It suggested something wrong with the system. Then I run sfc /scannow, I got “windows resource protection could not start the repair service”. The Windows Modules Installer service is started. Please tell me what to do? How to fix this problem? 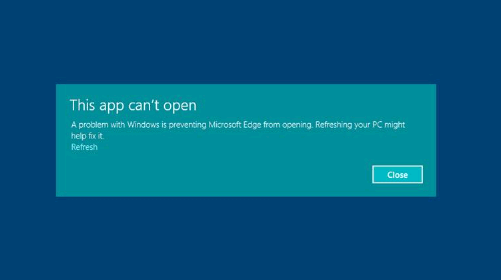 Why do you have “windows resource protection could not start the repair service” error? Why sfc /scannow commend doesn’t work? Published by James B. Gonzalez on November 29, 2016 5:18 am and last modified on November 29, 2016 5:23 am.